VIDEOGAMESPLUS.CA: Radiant Historia DS Coming Back In Stock! 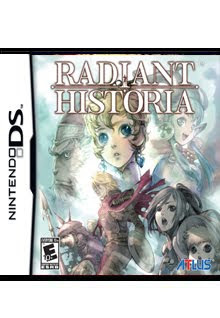 Due to huge demand Atlus has decided to reprint the awesome DS RPG Radiant Historia - DS (Preorder) . We are expecting the title sometime in March so the date of March 19,2012 we have is tentative. Pre-orders are open! Don't miss what looks to be your last chance to own a factory sealed copy of this great RPG! All I can say is that I wanted it since it was released but there were so many other games too and when I finally decided to get it it was sold out - not even a year out and it was alredy gone. I was lucky enough to get a new window copy of it so i got it. But dont miss out on this game!!! Next time im buying right away!